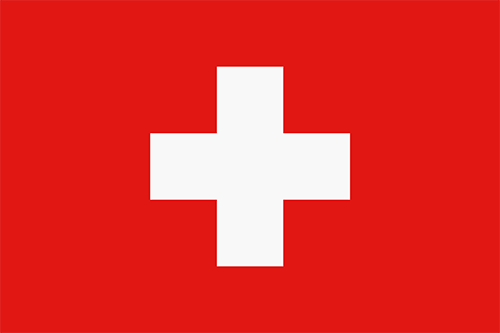 Even though Switzerland is not part of the EU, they do bring many of their national laws in line with EU regulations. As far as we can see, this is also the case with their regulations on the manual handling of loads, which are very similar to those of most EU member states. However, navigating through regulations and policies online can be difficult and confusing, which is why we have created this page. Guidelines for healthy and correct lifting, holding, carrying, pushing and pulling methods. 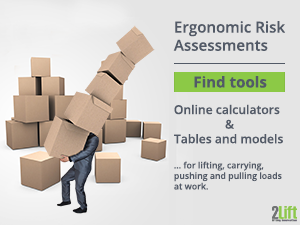 Ergonomic risk assessment tools for evaluating manual handling tasks in the workplace. 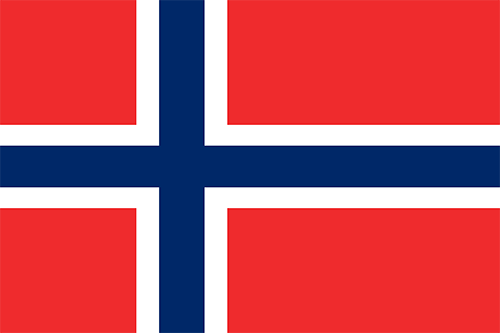 A brief introduction of the relevant authorities in the political field of occupational safety and health (which includes that of manual handling), so you know who to go if you want more information and other material, than what is presented here. 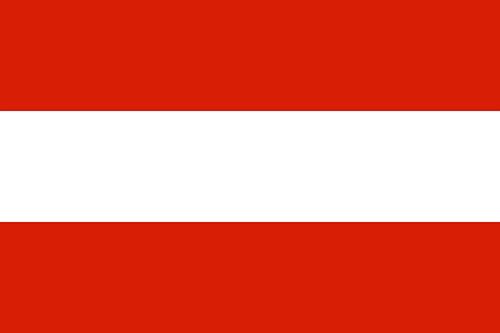 When it comes to the laws for occupational safety and health in Switzerland, there are two sets of laws to consider, the Labour Law and the Accident Insurance Law. The Labour Law covers all employment standards and basically deals with workers' rights, such as work hours, protection of health and personal integrity etc. In even fewer words, the Accident Insurance Law deals with work-related accidents and diseases. When it comes to upholding the Accident Insurance Law (which is the law most relevant in this subject), we need to look at the Federal Counsel who essentially acts as the overall supervisory body protecting employees from occupational accidents and diseases. 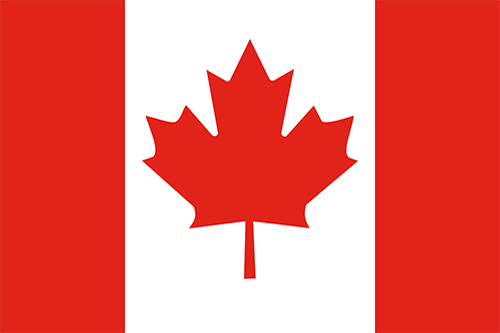 Safety (FCOS) / Eidgenössische Koordinationskommission für Arbeitssicherheit (EKAS) / Commission fédérale de coordination pour la sécurité au travail (CFST) / Commissione federale di coordinamento per la sicurezza sul lavoro (CFSL). FCOS acts like a central office with a controlling and coordinating function of the action orientated bodies mentioned in the next section. Thus 'below' the FCOS we have the 'executive organs', the ones that take action so to speak. 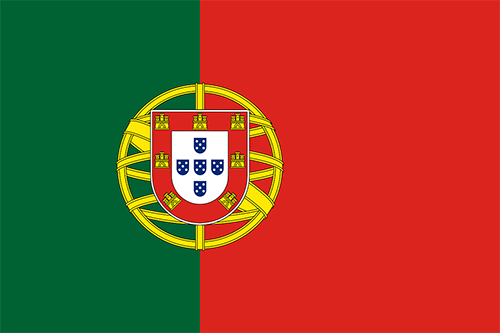 Their jobs are to supervise the implementation of the various policies regarding safety and health at work by e.g. providing advice to and monitoring companies. In other words, their overall job is to enforce the law. 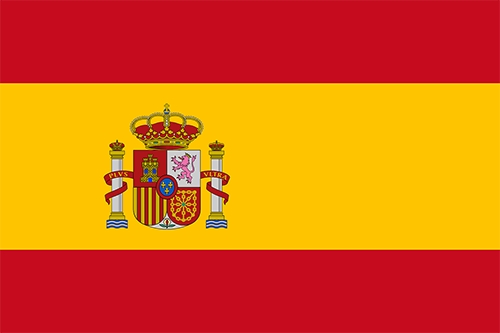 These 'executive organs' consist of SUVA (the main accident insurance authority) and SECO (the State Secretariat of Economic Affairs) along with the cantons and specialist organizations. Much of the material presented on this page, e.g. 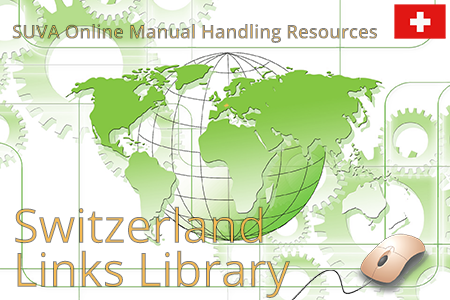 links to ergonomic guidelines and ergonomic risk assessment sheets for the manual handling of loads in Switzerland are created by SUVA. In Switzerland, like what is the case in many other European countries, the ergonomic guidelines for the manual handling of loads are of a preventive and protective nature. 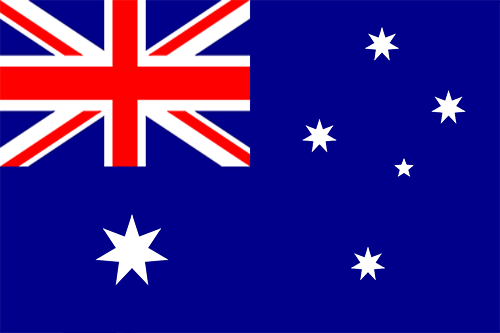 (See the Swiss guidelines in German, French and Italian. Manual handling of heavy loads should be kept to an absolute minimum. If manual handling of heavy loads needs to be performed, then the employer must take appropriate measures to ensure the safety and health of his workers. 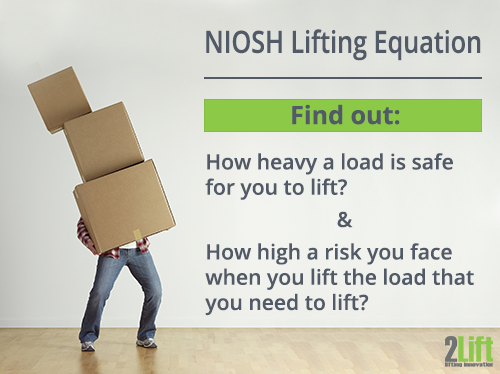 Workers must be informed of the weight of the loads and risks associated with their handling, and they must receive regular training in manual handling. 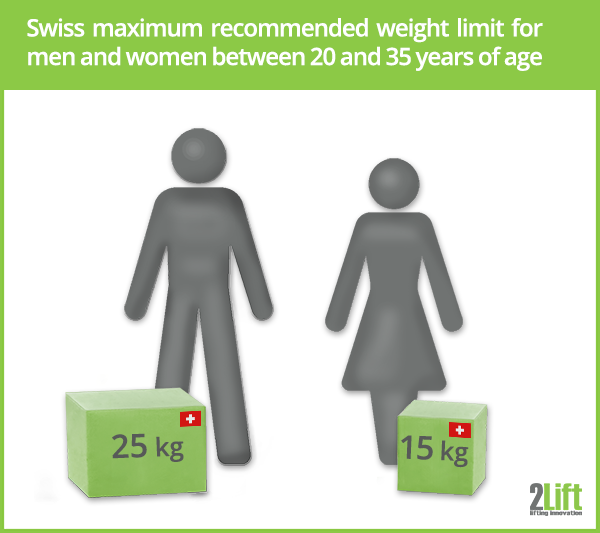 If workers are to manually lift heavy loads, Switzerland has established a set maximum values, that men and women may lift (under ideal circumstances). Being any older or younger than this (and when being pregnant), the weight should be reduced. You can see the ages and weight values in a table on this page (German), or on this page (Italian). Unfortunately we couldn't find a French version. 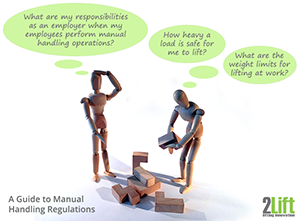 Also, if the manual handling tasks become more complex or strenuous, the weight of the load must also be reduced. Unfortunately this document is not available in Italian. In order to find out if your workers are engaged in high risk manual handling, SUVA has created an ergonomic risk assessment document (in German, in French, in Italian) which in English may be loosely translated as "Hazard Identification: The Lifting and Manual Transport of Loads"
A temporal evaluation based on the type of handling situation: Lifting, holding or carrying. The weight of the load and whether you're male or female. The types and extents of postures you're going through during the handling situation. The degree of external limitations in the working area. The document is fairly easy to fill out, but if you're in doubt, there are guidelines and an explanation. For instance, we had to read the explanation of the temporal evaluation several times to find out how to fill out the risk assessment sheet as we found it unclear that you had to choose between three types of handling scenarios. Fortunately an example of how to fill it out along with how to calculate the risk, is also included in the document, which is very helpful. If your workers are not lifting, but are instead pushing and / or pulling loads, SUVA has created another ergonomic risk assessment sheet (in German, French, Italian), for you to evaluate the amount of physical strain your workers may be subject to when pushing and pulling loads on wheels. 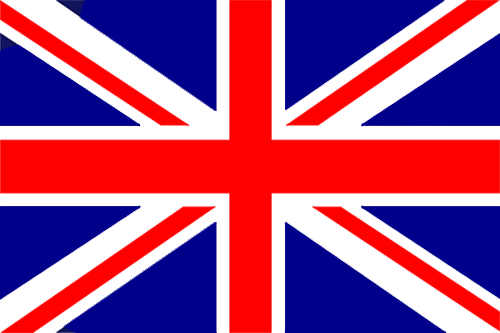 Loosely translated into English, this document is called "Pushing and Pulling Loads on Wheels. A Physical Stress Analysis." For a company to get as precise an overall picture as possible, a sample of at least three workers' handling tasks has to be performed. The number of variables to fill out in this sheet is more extensive that what was the case with the ergonomic risk assessment for lifting, and as far a we can see, there are no guidelines to read or examples to follow either, so it might be a bit more complicated to do than the other.